Want to hear a poker story? I mean, I’m playing a crap ton of poker and have not talked about it much. I play all sorts of games but focus primarily at 2-5 NL poker and sometimes 5-10. This year, however I’ve been playing 1-3 for fun as I wait for tournaments. Yesterday, I drove to the rio at 8am and the place was empty as hell, so I sat at 1-3 to wait for the 2am deep stack tournament. I bought in for 300 and after an hour and around 500 then was down to 300 then back up to 500, mostly because I call a ton of pots. At 1-3, why not? I lost a big pot to one guy who called my all in (I had the top set) and he an an open ended straight draw, and hit the river Ace to win after the money was all in. So maybe 30 minutes later, I was dealt pocket Kings in the middle position. I simply flat called the 3 bucks to which someone else raised it to $12 and I simply called that and 4 players saw the flop. I was third to act. The flop was K-8-5 with two clubs on the board. I bet $25 (half pot) and everyone called. The turn card was a red 10, so I still had the top hand. With around $150 in the pot, the first guy checked, the second guy checked, I bet $80 (half pot) and the last position called, the first position called, then the second guy (straight draw guy) shoved all-in with $300 or so. I then shoved all in, for around the $450 I had left. I still had the top hand. Then the third position, said “whatever” and shoved all in with around $400. Then the guy first to act waited 30 seconds and moved all in with $500. I was ahead but had a bunch of bad cards that could screw me. The river was a red 2. I had the nuts. Seat one flipped a Ace-4 of clubs for a missed flush draw. The second seat flopped a set of 8s. The fourth seat mucked his cards. So there I was. 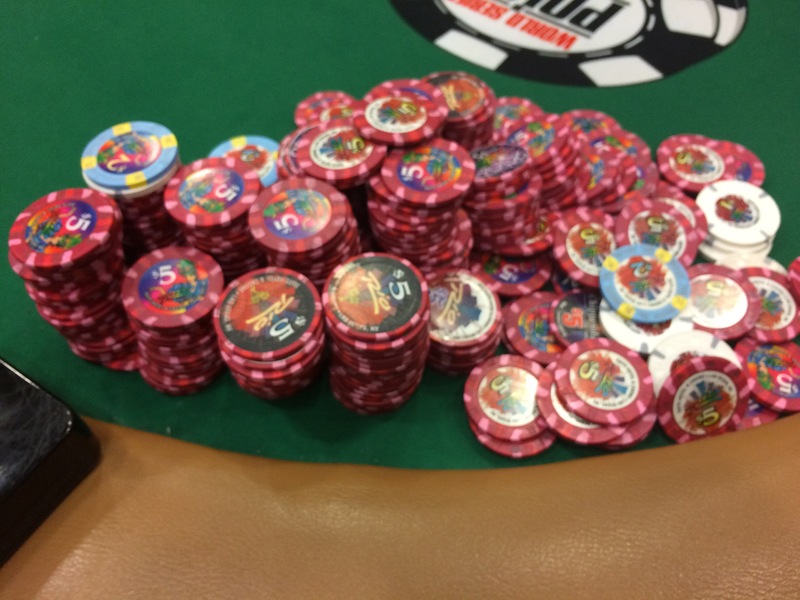 Raking in a $1500 pot on a 1-3 game. And all of it happened because I didn’t push my kings hard before the flop. I played another hour and left for the pool.